Hungary Hatoslottó, often also referred to as Lotto 6, is one of Hungary’s two premier lottery games. It features dead-simple game mechanics, very favourable odds, and tax-free winnings at all prize tiers. On top of all that, its low ticket prices are the icing on the cake. But how does it stack up against other European and international lotteries? We’ll find out below. The roots of Hungary’s lotto scene go way back to 1763, when the first-ever lottery draw was held in Buda, the former capital city. The lottery was introduced as a means to both entertain and reward people, as well as to generate additional money for the state. Initially, the draws took place with very little regularity, often weeks and months and sometimes even longer apart. In 1868 the Hungarian Royal Lottery Board was founded, which made things a bit more consistent, but lotteries in general didn’t become immensely popular until much later: the late 1980s. That’s when a Hungarian state-owned lottery operator named Szerencsejáték zrt—good luck pronouncing that if you’re not from Eastern Europe—was established to vary the types of games residents could play as well as create standards for all of them. Many of the proceeds that this company makes support all sorts of beneficial causes around the country, including schools, cancer research, various sports and fitness programs, cultural activities, and general social well-being. As for Hatoslottó itself, its first draw took place on October 29, 1988, and the additional Joker draw (more on this later) was introduced in November 1993. Hatoslottó originally had a double-matrix format that comprised the 6/45 format that’s still around today as well as a bonus number that determined the secondary prize winner. In July 2007, however, this number was removed, making the game easier than ever. Hatoslottó’s single-matrix 6/45 format is one of the simplest of any lottery game in the world. 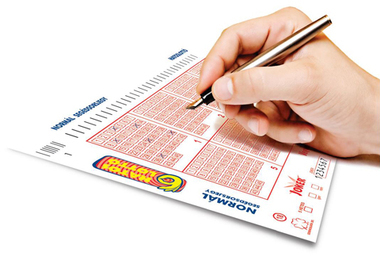 Players choose 6 numbers from a range of 1 to 45 or use the quick-pick option to have the computer randomly choose 6 numbers for them. That’s it. There are no bonus numbers or extra numbers or super numbers or anything else. If you match all six numbers, you win the jackpot. Sounds simple enough, right? That being said, there is an additional game (at an additional cost) that players can opt to play that is known as the Joker. This game has a pool of only 10 digits (from 0 to 9), which might seem extremely easy to win, until you realize that in order to do so your numbers must match the numbers that are drawn in the exact same order. The minimum matches you’ll need to win a prize is two, but the more numbers you are able to match, the more money you’ll be able to win. Playing Hatoslottó is cheap—within Hungary official entry tickets cost HUF 225 (about €0.71), while entering the Joker draw costs an additional HUF 200 (about €0.63). This really makes this game a great value, especially considering that the minimum prize up for grabs each week is HUF 60,000,000 (about €188,598). Hatoslottó is also a rollover lottery, meaning the jackpots can keep growing and growing if nobody wins one. Though there is no hard cap on the number of rollovers, they cannot occur for longer than one year, which is a rule fairly unique to this particular lottery. Although it’s pretty unlikely that a jackpot would roll over for that long because of Hatoslottó’s great odds, if it did make it past one year, it would roll down to the secondary prize tier and be split equally among all of its winners. If you decide to play Hatoslottó, you’ll have a 1 in 8,145,060 chance of winning the jackpot. That might not seem all that encouraging at first glance, but those are actually pretty amazing odds compared to many other major lotteries. While you’d have identical chances of winning Austria Lotto 6 aus 45 lottery, you’d have an exponentially harder time winning EuroJackpot (1 in 95,344,200), EuroMillions (1 in 139,838,160), Italy’s SuperEnaLotto (1 in 622,614,630), or even the US Powerball (1 in 292,201,338). Your odds of winning Canada Lotto 6/49 (1 in 13,983,816) would be somewhat tougher, but your chances of winning a regular Swedish Lotto jackpot (1 in 6,724,520) would be a bit better. The Hatoslottó lottery draw (and the separate Joker draw, which comes immediately after) takes place in Budapest on only one day each week: Sunday at approximately 3:50 pm GMT. The results are usually publicized online and on television within 2 hours. However, ticket sales end at 9 pm GMT on the previous day (Saturday), so keep this in mind because any tickets purchased after this time will be automatically entered into the following week’s draw instead. All prizes are awarded in a one-time cash payment and must be collected within 90 days of the date of the draw. In other words, make sure you claim your winnings before you head off on that long backpacking trip! Neither the winnings of residents nor international lotto players are taxed in Hungary. If you’re playing from abroad, however, double-check your local tax laws to see if lottery prizes are taxable. Due to its great odds and cheap price, Hatoslottó is becoming increasingly popular among lottery players who live outside Hungary. These people tap into Hatoslottó through various online lottery agents and lotto betting sites, which allow people to play a wide range of exciting lotteries from almost anywhere in the world. Compared to the traditional way of buying tickets by walking—or in this case flying—to the nearest Hungarian lottery ticket seller‚ such companies make the process of playing Hatoslottó much simpler and enjoyable from start to finish. Hungary Hatoslottó – Is It Worth Playing? Hatoslottó is absolutely worth playing! It’s an excellent game with a very easy format that anyone—even the most inexperienced lottery players—could understand immediately. While the prizes aren’t the biggest, they are always respectable and sometimes roll over to life-changing amounts. On top of that, the ticket prices are cheap by practically any standard, the odds are great, and the additional Joker game gives even more chances to win. If that’s not worth playing, then what is? Glad I did found out about this amazing lotto! Very good gamplay and prizes. Cheap tix too.